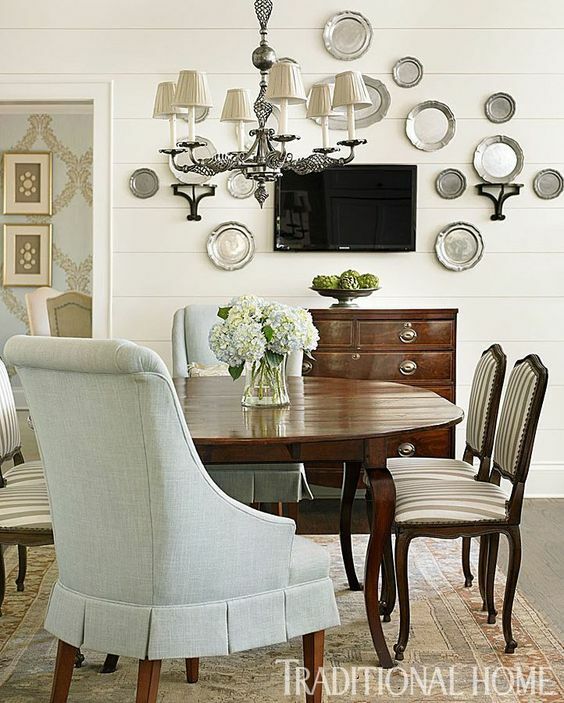 I’m not sure when I first fell in love with the idea of decorating with pewter plates, but I’m pretty sure it was around the time I saw this photo! How gorgeous is this kitchen?! And the pewter plates on the range hood just take it over the top. Design by Suzanne Kasler. By designer Elle Scrase via Decorpad. 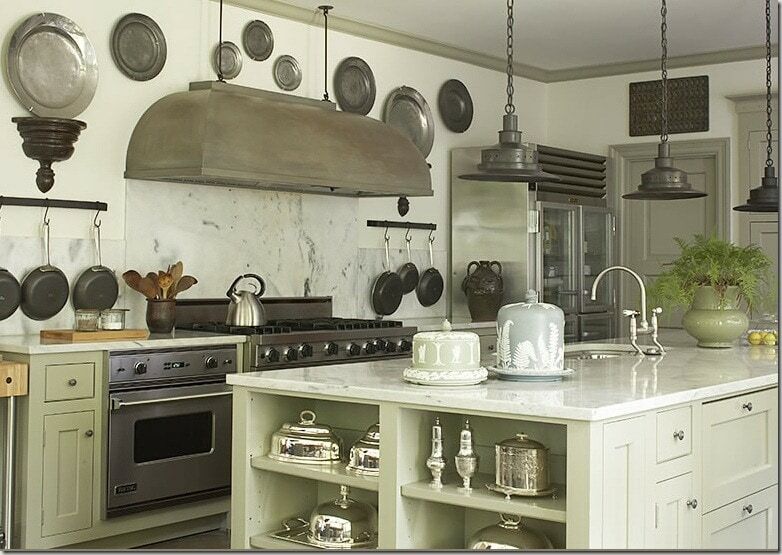 Love these pewter plates in a kitchen by designer Jackye Lanham. Another amazing kitchen by Jackye Lanham. This time she mixes the dull antique pewter with shiny silver. Love the contrast! 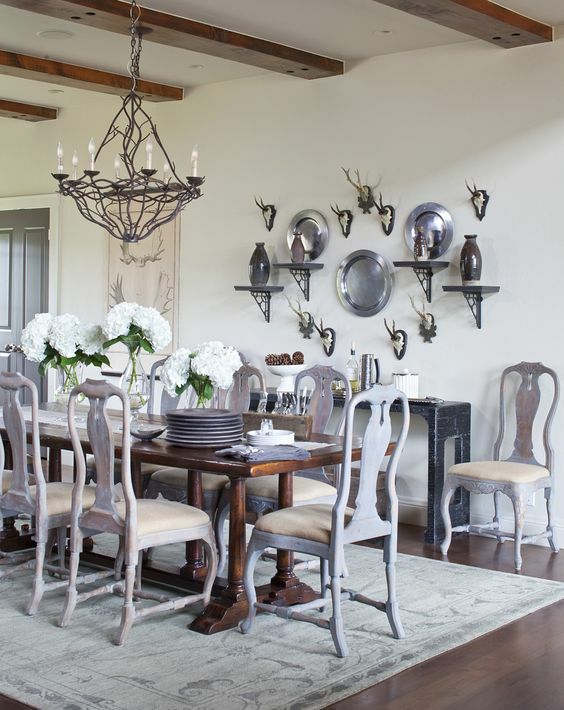 Designer Lauren DeLoach via Traditional Home. Design by Jessica McIntyre via Colorado Homes & Lifestyles magazine. How cute are these pewter pitchers?! I think I’m in love! Via Better Homes and Gardens. Though pewter plates is probably the most common way of decorating with pewter, vintage pewter in any shape or form is great. Pitchers are especially charming! 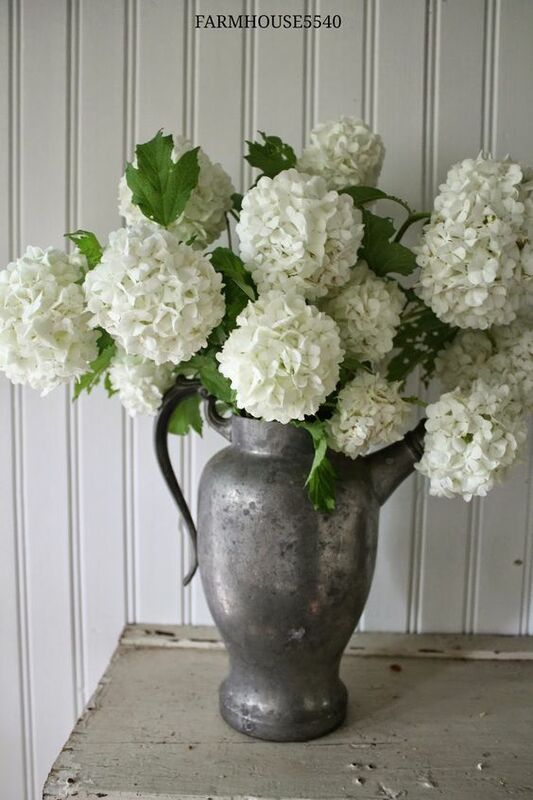 Hydrangeas in a crusty antique pewter pitcher. Love this! Via Farmhouse 5540 blog. You might remember this photo from my post on vintage baskets, but it was too good not to use again! 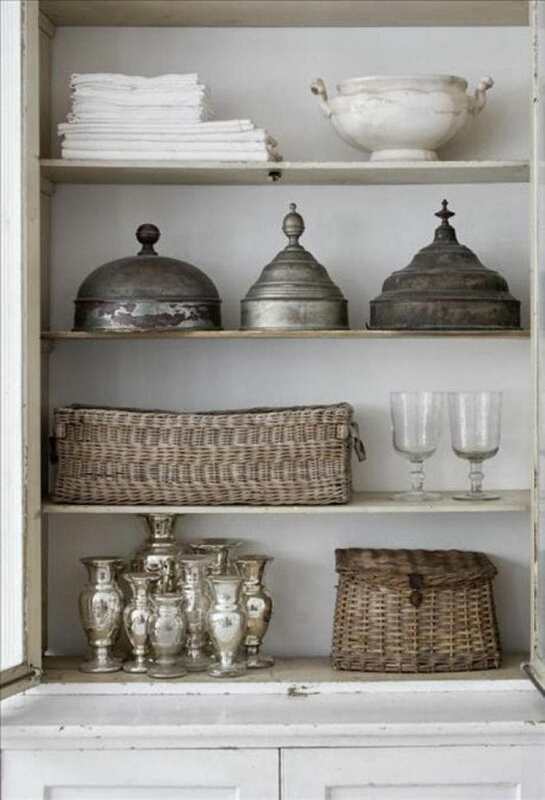 Here vintage pewter lids are displayed like art in this wonderful shelf styling. What’s great about decorating with pewter is you can add some gleam to the room, without it being too shiny. Silver is always a classic, but when you don’t want that much shine, this is where pewter comes in. And it seems especially appropriate in fall. To me, less shine seems to go with the season and the darker colors and cozy feeling. 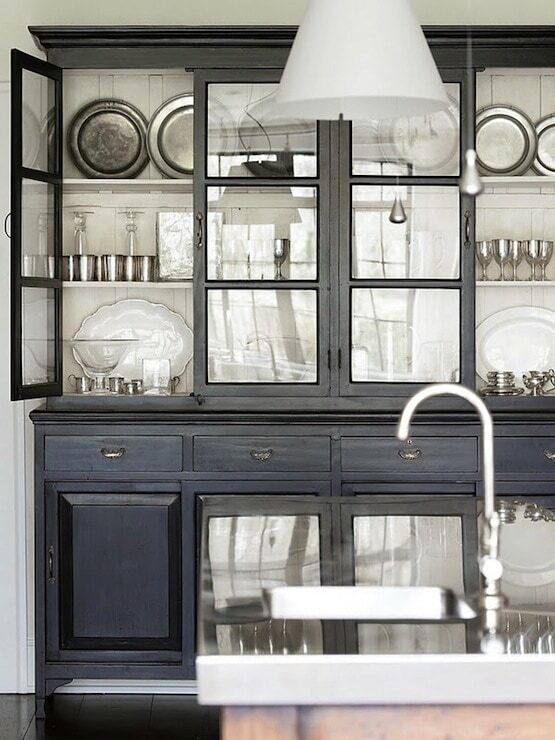 Beautiful cabinet with vintage pewter plates and cups. 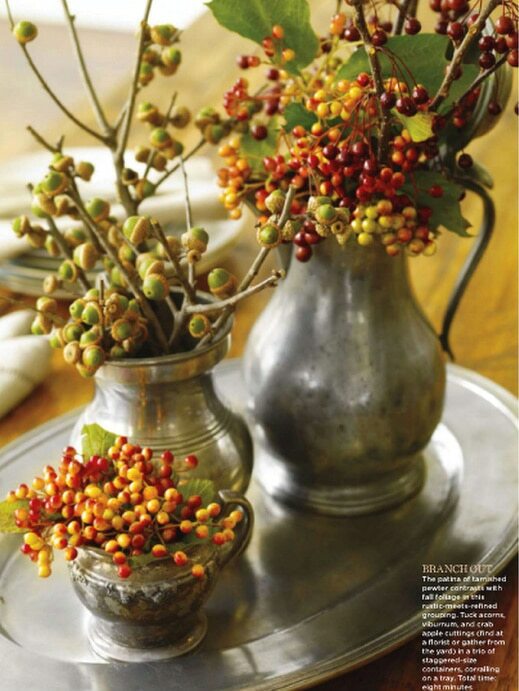 Via Atlanta Homes and Lifestyles magazine. And the other great thing about decorating with pewter? It’s not such a big trend that it’s everywhere (at least not yet!) It’s around, but it has yet to catch on in a big way and I love the idea of having decor that is not in every house you see! Granted, pewter can sometimes be slightly more expensive than silver plate. However, I’ve usually found that the vintage items are substantially less expensive than the new. And as you can see, you don’t need a lot of pieces to form a “collection.” In the first photo, there are only five charger plates over the range and it looks fantastic! I love this article – thank you so much! I’m going to go look for some pewter – today! Your posts are so interesting. The only piece of pewter in my household is a mug (presumably for beer) that my husband got when he was a best man in a wedding (a long time ago). I am going to dig it out of storage and see what I can do with it. Thanks for the inspiration! I’m so glad you enjoyed it Linda! I try to share things that interest me personally, not only what is trending or “popular.” So it’s lovely to hear from someone who enjoys it! Thanks so much for taking the time to stop by, and to share. I appreciate it so much!